SPX: The SPX gapped up again and almost touched the 50% retracement at 1121. Since Friday it has formed a nice impulse to the upside, that I think is in its final stage now. Its subwaves have some nice fibonacci relationships: wave (1) = wave (5) = 0,382*wave (3), so actually a perfect impulse with an extended third wave. From here I expect us to drop till the end of the day or even tomorrow. 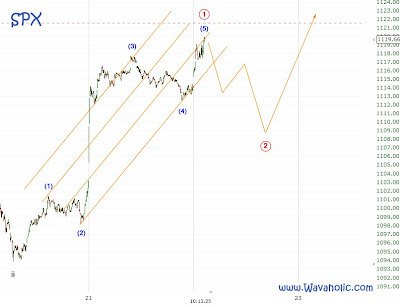 Since it's a wave iii the retrace might be only shallow, so a possible target is the wave (4) low.